On lifting the boat I noticed the filler had come out of a 10cm gap between the hull and the keel. I have always understood this is simply filler and not a structural component. To resolve the issue I would simply put some Sikaflex in. But, is my diagnosis correct? The yacht is a 2010 400. On my 2001 371 cracks began to appear around the keel-hull junction about 5 years ago. We had the filler removed, it was definitely not structural. We also removed the keel, checked the bolts, which were as new, and rebedded it after sandblasting and epoxying. We did not replace the filler as it looked like a lot of work for no real purpose. The boat seemed faster after this was done, but we also removed years of old anti-fouling which was rough and peeling in places. In your case I would either just patch the filler, or remove it all, but leave the keel in place. My keel didn't really need to come off, and because the mast also had to be removed so the boat would not capsize in the cradle, it was a costly operation. 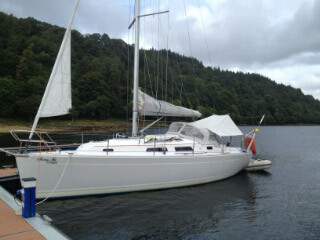 I had the same issue at the front of the keel and was advised by Dealer just to Sikaflex the gap. I also have 2010 400, i have the same issue around the rear of the keel, it happens only when out of the water as boat sits in cradle with full weight on keep and strops and when lifted again the hull flexes up and away from the keel cracking the fairing. I have checked keel bolts, they are all tight but rear keel bolt is some 200mm in from rear of the keel, the hull has considerably flex. Our local Hanse agent went from fairing the keel to hull to simply putting a bead of Sika instead, this resolves the problem on later models. In my case i arrange for the boat to be lifted and left in the hoist over night before re-launching, when up in the hoist with full keel weight now in downward direction i repair and paint the cracked filler. Frustrating but only alternative is to remove all of the fairing and put sika bead instead. I would be concerned about compromising epoxy and keel finish if trying to clean the fairing material off. Anything under the water line that will be fixed in place for many years like keels and through hull fittings requires a good adhesive sealant like 3M 5200, this is a step up from Sikaflex. 2 Versions available, normal cure and fast cure, colder climates may require a fast cure.